There are many great ways in which you can take your CBD. From edibles like deliciously infused cupcakes to tinctures in small bottles with droppers, there are many ways to take this remarkable and increasingly popular compound – all of which deliver slightly different results. CBD comes from the cannabis plant and is thought to be one of its healthiest and most beneficial components. But there are those who don’t like the taste of the drops and others who want to watch the calories when it comes to the sugar-filled cupcakes. That’s where CBD vape pens come in and they’re taking off in a big way. Welcome to the wonderful world of vaporizing – the latest way that people across the world are enjoying their CBD. Disposable CBD vape pens are the perfect option for those interested in minimum hassle but maximum convenience and, of course, effect. Vape pens are great for those on the go and with a busy daily schedule. They’re also equally great when it comes to kicking back at home after a day’s work. And when the disposable CBD vape pen is done you simply toss it away and move on ot the next one; either to more of the same or another great flavor. CBD vape pens are simple and work in a similar way to an electric cigarette or “E-cig.” A battery heats an element which in turn vaporizes the liquid inside, delivering just the right of CBD goodness to the user according to their needs. As soon as the vape pen reaches 400 degrees Fahrenheit, the built-in atomizer turns the liquid into vapor, delivered directly to the lungs. It’s about time we took a closer look at five of the best disposable CBD vape pens on the market today – all of which we guarantee will take the edge off. 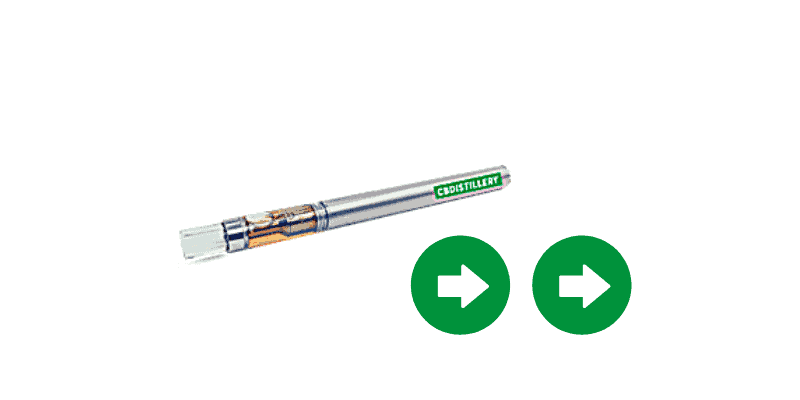 First, on the list, today is the SelectCBD disposable vape pen. This little beauty offers the purest CBD extract available, enriched with the best-quality refined spearmint essential oils for that vaping experience that is second-to-none. Offering a CBD dose of 1-2 mg per 3-second puff, this is a vape pen that needs to be experienced to be believed. The ceramic core technology included evenly distributes the right amount of heat to the oil to hit that sweet spot every time. The SelectCBD vape pen comes packed with 250 mg of CBD and the cartridges are airtight and spill-free. 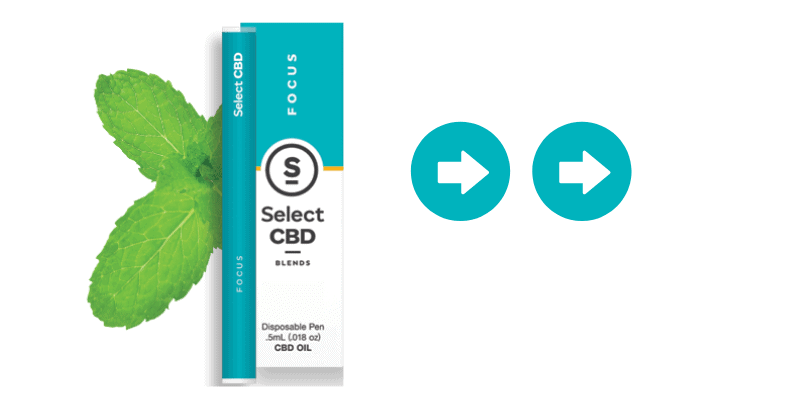 Six delicious flavors are offered across the SelectCBD vape pen range and are pure, containing only three ingredients: CBD oil, coconut oil, and essential oil for flavor. You get to choose from six great flavors: Lavender, Grapefruit, Spearmint, Peppermint, Cinnamon, or Lemon, and it’s only a matter of time before the company rolls out more flavors to add to their already robust collection. You can purchase the full range of SelectCBD’s disposable vape pens here. If you’re looking for just the right amount of full-spectrum, totally organic CBD, then look no further than CBDfx’s great CBD Vape Pen. The fresh taste of mint will have your taste buds crying out for more with this vape pen, which is also very discreet and requires no advanced knowledge of vaping. The mint flavor inside this device blends perfectly with the herbal flavor of high-quality hemp, leaving you with a cool and breezy inhale and a refreshing and sinus-clearing exhale. The unique mix of ice and CBD is what keeps people coming back for more. Due to being at the forefront of the industry, CBDfx only works with the best organic hemp farmers to ensure that they always get a regulated supply of the main component of their products; CBD. Being disposable, the CBDfx Vape Pen requires no charging and no annoying fiddling around; it’s as easy as taking out of the box and taking a puff. Considered by many to be the Rolls Royce of vape pens, this product arrives with a gold-colored brushed metal with the CBDfx logo near the mouthpiece. In terms of style and elegance, it doesn’t get much better than this. You can purchase the full range of CBDfx disposable vape pens here. CBDDistillery, a big name in CBD-related products online, recently upgraded their entire CBD Vape Line by investing in luxury vape technology in order to deliver a superior product to their customers. 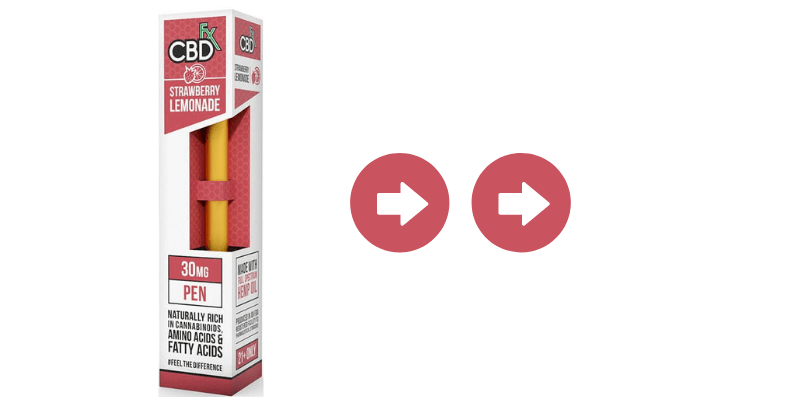 Their 200mg Grand Daddy Purp Disposable CBD Vape Pens, for example, are formulated using the finest-quality CBD extract, Tec Temper Oil, and natural botanical terpenes. This vape pen delivers CBD along with a delicious berry/grape flavor that never gets boring. The company proudly boasts their use of CCELL technology in their vaporizers. The CCELL system helps to deliver the right hit each and every time no matter how thick the CBD is. All the materials used are 100 percent natural, organic and food grade. Products are free of PG, VG or MCT and are all manufactured in an ISO Certified Facility to guarantee consistency. The liquid inside the device is made from the highest quality, Colorado-grown, Pesticide Free, NON-GMO hemp-derived CBD. This is all tested regularly by a third party and is combined with the tasty grape flavored terpenes that CBDDistillery’s customers known and love. You can purchase the full range of CBDistillery disposable vape pens here. 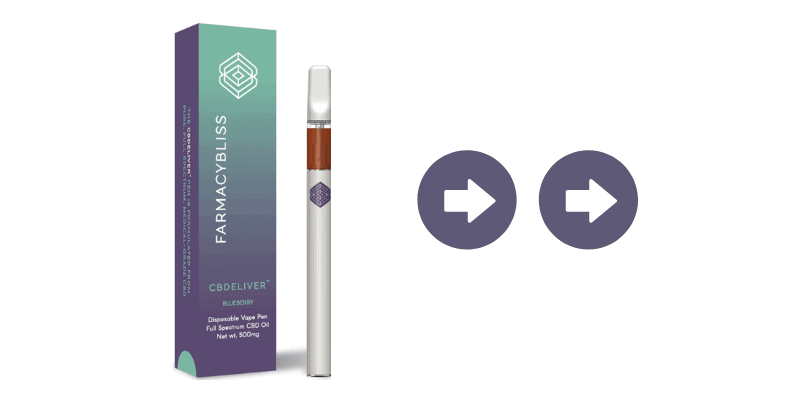 Farmacy Bliss’ disposable CBD vape pens are packed full with some of the best, proprietary blends of the highest concentrations, CO2-extracted, full spectrum CBD available on the market today. Each disposable vape pen comes packed with 180mg of full spectrum CBD oil and has a blueberry flavor which many customers know and love. No thinners, solvents or fillers are used in the manufacturing process and all their products are free of additives, pesticides, and heavy metals. 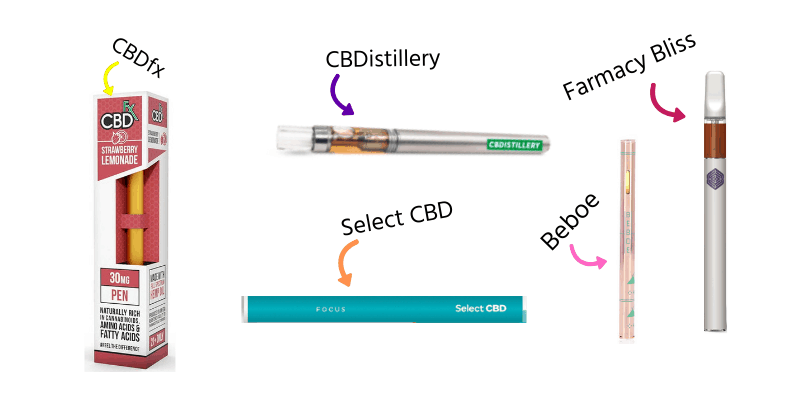 The CBD liquid inside Farmacy Bliss’ disposable vape pens are made in America even though the CBD inside is grown in Holland. The Farmacy Bliss website claims that thousands of people have benefited from using this product, which has helped them with issues such as anxiety, pain, insomnia, and headaches. This product is one of the sleeker looking ones out there, with its delicate design and neutral colors. A few 3-second puffs of blueberry yumminess is all you’ll need to keep your day stress-free and productive with this one, and it is recommended that you purchase some replacement cartridges when buying the starter kit so you don’t get left without your daily stress reliever ever. You can purchase the full range of Farmacy Bliss CBD vape pens here. This is definitely one for the ladies even though vaping CBD is a totally non-sexist affair. The pink shades and delicate design of this product have made it more popular among the fairer of the species and for obvious reasons. But there are also plenty of manly men out there who are comfortable enough with their feminine side to use it. Each pen contains a whopping 500 mg of naturally cultivated CBD oil blended with calming essential oils and plant-derived citrus and grapefruit terpenes. This makes it a refreshing and zesty vape that can be enjoyed any time of the day or night. On top of that, you can expect roughly 120 doses from this little pen which packs a big punch. 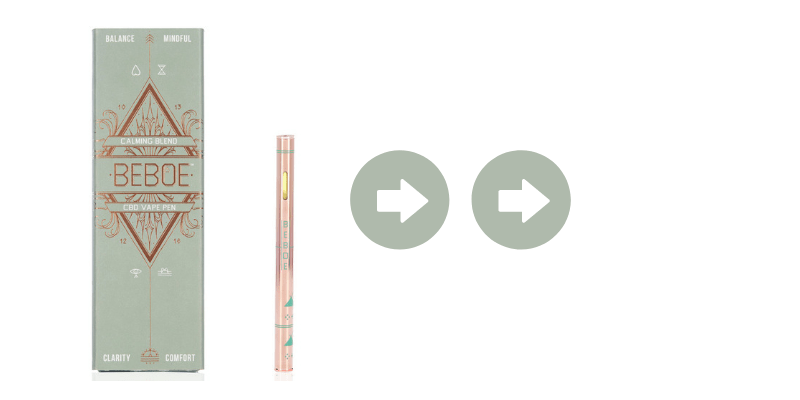 The packaging is also elegant and discreet and looks more like the latest E-cigarette pen than anything else. While some people could care less about the style of their vape pen, others find that aspect all-important. Beboe is a company who leads the way in the world of CBD and their disposable CBD Vape Pen is an example of a brilliantly designed product which has practicality, style and results in mind. You can purchase the full range of Beboe disposable CBD vape pens here. When purchasing disposable CBD Vape Pens it’s well worth taking the time to thoroughly research the product you are interested in, taking into account the overall look and feel of the product as well as things like quality of ingredients, safety and of course price.